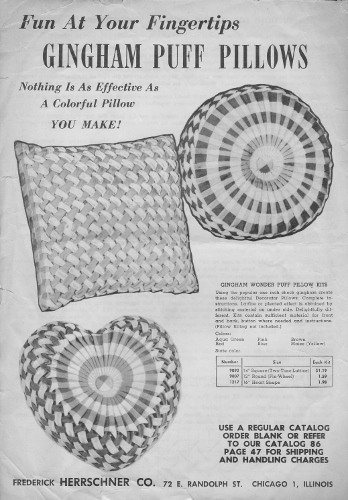 I was born and raised in Alabama, the place of my father's birth, so when I first began Piecework Treasures blog and named it as such, in my mind's eye I would be discussing and including a lot of my Alabama Granny and Great-grandmother's works and patterns simply because I spent so much time with them. But the blog seemed to take on a different direction in sharing of my own work, ideas, patterns and 'journey'. My mother was from Oklahoma with all her family still living in Oklahoma today. These past few years, as I've (finally!) been going through boxes from my Oklahoma Granny, who passed away in her 80s in the mid 1990s, I've been amazed at the variety of her work. I always knew she sewed, as I remember meeting some of her clients as they came to the house to be fitted during times I was visiting out there. My grandfather, her husband, was involved in a horrible accident at one of his oil rigs when he was in his 50s and my grandmother used her talent and accomplished sewing skills to sew for others to bring in a little money to support them as she cared for him 24/7 until he passed away 25+ years later. She was a very strong woman, and though not 'warm and fuzzy' like my Alabama Grannys, I always loved and respected her. 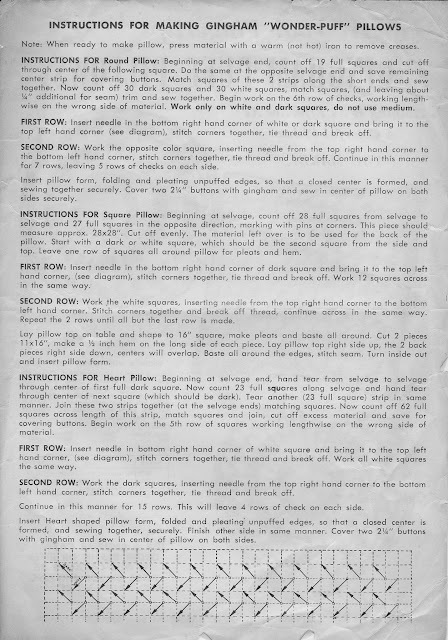 So, today I thought I'd post a copy of a pattern she used that I so vividly remember. The above photo is the scanned pattern in 'color' to show the brown and faded edges. She made the round 'puff pillow' in a purple-dark burgundy-ish fabric and it was beautiful. The pleats on the side almost looked braided, as I recall. She did not use a 'gingham' fabric, though possibly the fabric might've been a plaid of light/dark squares. I wish I had the original pillow. What is strange, is that going through her pieces of work and patterns she used, I feel that I'm beginning to finally 'know' her. Imagine my surprise to find she also crocheted and tatted beautifully. So, when we too are someday gone, and our work might remain, maybe the generations behind us might get to 'know' us too? Oh, and please feel free to use this free pattern for your own, personal use. It is not meant to be sold.... simply to be shared. Thanks! 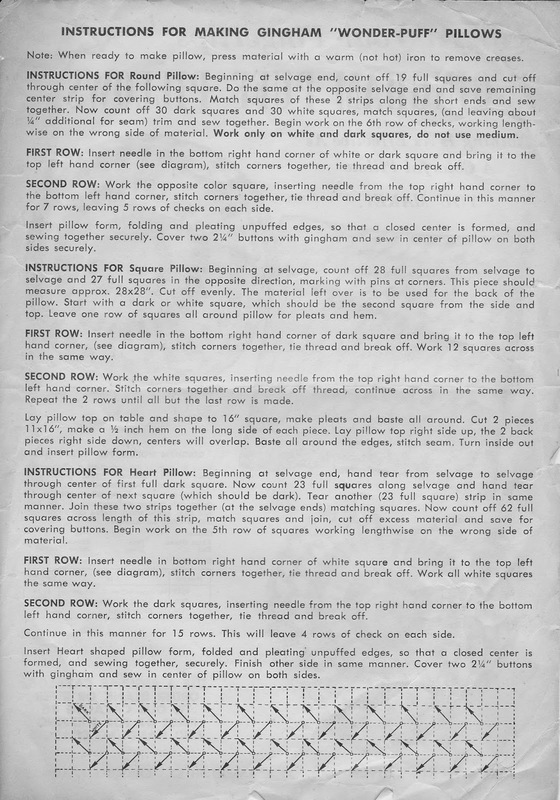 UPDATE 10.4.2013 ~ click here to read more of this unfolding story, including photos of 1966/1967 pillow. 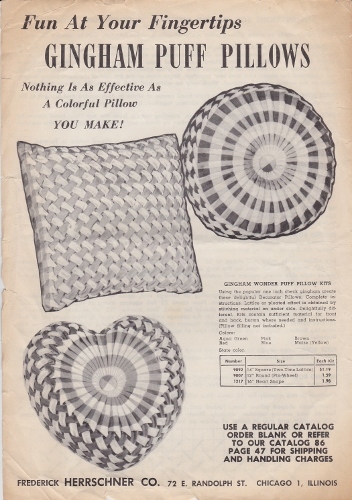 UPDATE 3.10.2015 ~ Added a different pattern from my grandmother's files we think might be the 1966/1967 pillow's pattern at the above link. Click here.